Awsome wallpaper! This is one of my fave series. This wallpaper of Kenshin is very nice. I love the image that you used, and what you did on the bg is nice too. Good work all around, I love it. The texture made me fave it! I like it soo much! 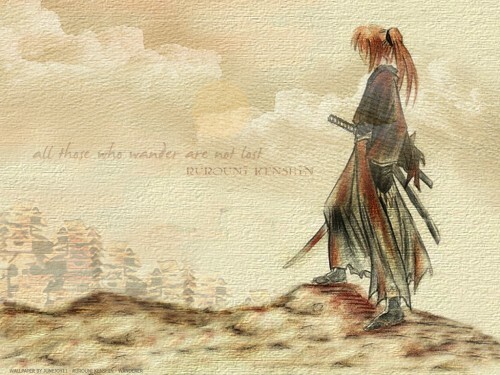 Not to mention that Rurouni Kenshin is one of my fav serie! that pic in 1 word: excellent! Awesome. I love the texture, and is that quote a line from Aragorn's riddle? It sounds like it, and it certainly fits. The buildings look odd (they didn't get textured), but the wallpaper is great otherwise. how I love the quote! Great work! whow..this is a very pretty piece of water color art! thanks! I love this scan! Thank you for sharing! love the clouds, color part the character is well done too, great job! really cool! way to go with the texture!